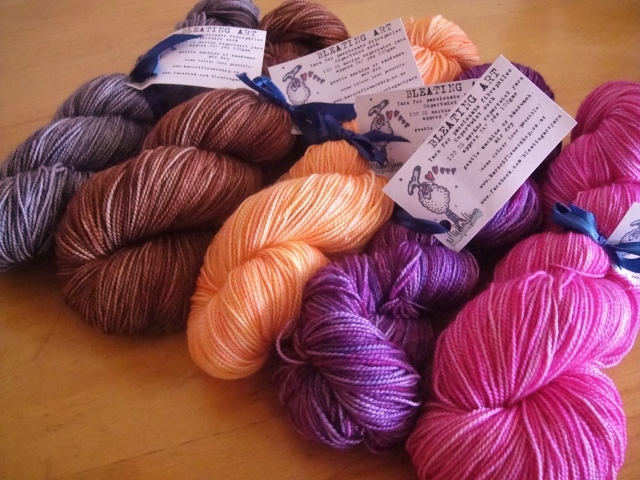 It’s no secret that I’ve got a bit of a crush on Circus Tonic Handmade‘s yarns. They are simply gorgeous and if I had my greedy little way, I’d own much more of this beautiful yarn, in particular Revelry Sock. Why do I like it? It is soft. Super soft. And it doesn’t split on the needles. Despite its softness, it is hard wearing. And let’s not forget the talent of the hard working dyer who makes the prettiest colourways. But equally importantly, it’s the finished result that really gets me – I just love the way this yarn turns into amazing looking garments that look and feel stunning! I like it so much that I can’t seem to keep the yarn in my stash as it keeps getting used for projects! This is an interesting development for this compulsive yarn hoarder collector. I thought it would be nice to know more about Hannah Ginn, mother-of-three, wife, scientist and creative energy behind Circus Tonic Handmade, and she kindly agreed to an interview! I understand that until recently, you worked as a Molecular Geneticist. Dyeing yarn is a bit of a change! Why did you choose to become an indie dyer? 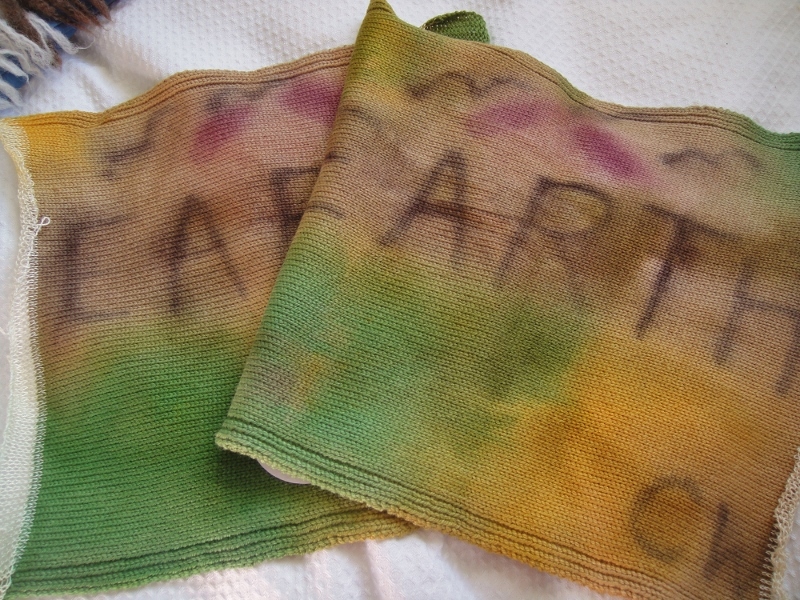 You will surprised to know that I have met quite a few ex-scientist yarn dyers. Maybe it’s something to do with not being afraid of “lab work” or confidence with working with exact amounts of chemicals and liquids. The actual chemical reactions taking place are interesting….how you can alter them with acidity levels or the actual fibre used. We are very process driven people, so the prep, dyeing and then producing a saleable skein takes many many steps. Once you factor in weather, the attention to detail needed for planning stock updates might just be our forte! Once I found luxury hand dyed yarns…and even before….I found the yarn selection brought me so much joy during a knitting project. I was completely in love. Once I stopped working to take care of our three young kids, I desperately wanted to have a business ticking over that involved my love of yarn and something I could devote energy to. I read books, watched as much You-tube content as I could, reached out to dyers and experimented for months on 20g mini skein samples I made. I was always on Etsy buying yarn anyway….and started to really pay attention to why certain products jumped out at me. Sometimes I didn’t hesitate to buy, and I tried to figure out why. Why the name Circus Tonic Handmade? Our house is a madhouse, like a circus. Our surname is Ginn where you pronounce the G as in gate. Many people say Gin as in the drink. So that’s one reason for the Tonic. The other meaning of tonic is that craft, knitting and making by hand is a remedy or salve for the crazy busy life many of us lead. Circus Tonic Handmade. What did you look for when you selected the bases for your range? The yarn sourcing is the hardest bit by far. As I knit a lot of kid knits, I was looking for soft to the skin, superwash but tougher yarns. I was looking to source yarn as locally as possible that I could sell for affordable prices. I started with only a few bases. As my business has grown and favourite friends and customers have let me know their hearts’ desires, I am about to expand with a super luxe silk, cashmere and merino blend, a merino bamboo blend and a sparkle sock base. I am also about to bring out a 10 ply heavy worsted weight 100% merino that I am in love with and need to knit hats out of immediately! I love that you used bird colours as the inspiration for your first collection. I’ve personally always thought that nature gives the best inspiration! What inspired you to choose birds? What’s next? To be honest, I was nervous about colour theory. I wanted to offer muted, tonal shades that were sophisticated and in the league of some of my favourite dyers. I knew what I liked but had no idea where to start. I have always collected antique books on natural history subjects, and I live on the coast of Australia, so with the combination of the scenery on the doorstep and the beautiful illustrations in my books, I felt ready to tackle colours for yarns that I could not find in the marketplace. My next collection has finally settled on The Antipodean Garden. Native flora and fauna of our Pacific region…including the introduced favourites we all grow or would love to grow if we had a garden. I will try to capture the gardens of our childhoods….or present…or future. Our grandmothers’ gardens…or the little strip of planting in the town centre near the bus stop. There are an incredible range of stunningly beautiful, wearable colours to choose from and I am really looking forward to attempting this!! How long have you been knitting for? How did you learn? 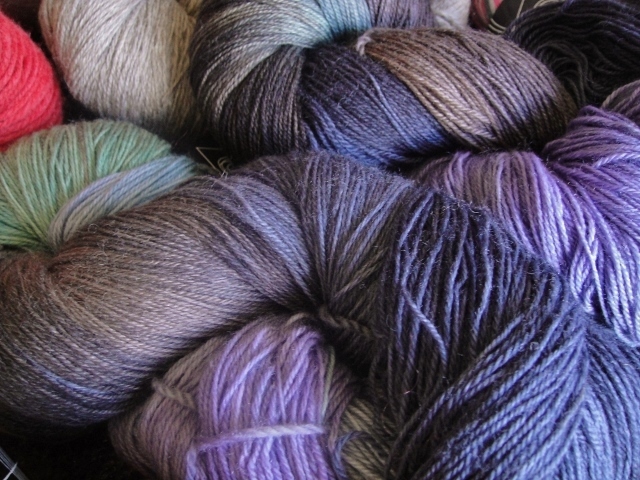 Has your knitting influenced your choice of dyeing style? I was taught as a child, and then took up the needles with a vengeance while I was expecting my third baby due in our winter. I had wanted to learn for several years and in all those evenings not drinking wine focusing that pregnancy nesting tunnel vision, I knit about 30 baby cardigans, found Ravelry, found Etsy and never looked back!!! I watched video tutorials, bought a whole lot of books and again, experimented! I have tried a lot of different styles of hand dyed yarns. 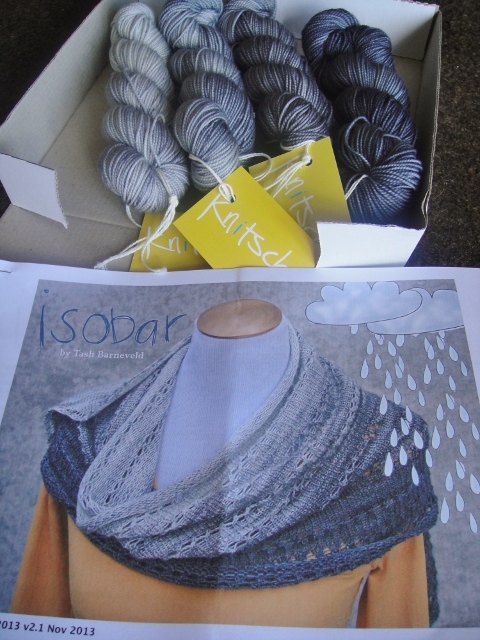 I love speckled yarn for striped shawls, tonal semi solids for baby knits, one colour shawls and hats. I love saturated yarns for lace and minimally dyed yarns for hats with cables. There is such a thing as that magic moment when you absolutely chose the right yarn for a pattern. I suppose I’m conscious to offer all those possibilities to my customers. I also dye the same colourways slightly differently to suit each base…as a nylon sock yarn will take dye very differently to a relaxed ply DK wooly yarn. I try to be sympathetic to each base to let it sing “pick me! !” I like adding splashes of surprises so that there is interest held throughout the knit. I’m really impressed at how quickly your yarn has become so popular. I’m not surprised though! Quite a few designers have also already produced work in your yarn. Do you have a favourite design so far? Thank you! There’s that tunnel vision coming into good use again! I won’t lie, I’ve worked very, very hard on this business. I have worked seven days a week since well before I launched the shop. However, it doesn’t feel like work. I can still look after my children and produce semi decent meals. I don’t iron or mop….but to be honest, I never really did. I love interacting with everyone, and meeting so many brilliant, supportive creative people. That has been the best surprise!! This new community has encouraged and supported me and I will be forever grateful. I don’t have a favourite design so far. I am floored with amazement seeing every single one of them. I get all fainty…I just can’t believe it. There are some seriously talented people out there and I am beyond thrilled that people have been picking up the yarn and loving it as much as I do. It makes me very proud. Can you say that about yourself?! I just did! Favourite moment as an indie dyer to date? Working for many years behind the scenes in labs within a large research organisation you are pretty much nameless. It’s exciting work and there are great people but of course personality is just something that gets in the way, rather than something to be celebrated. Everyone enjoys seeing their name out there and so to be totally honest, seeing my yarn reviewed and talked about on blogs that I have read religiously for many years……well there’s that faint feeling again, it’s so awesome!!! In real life, favourite moments have happened standing over the dye pots and seeing the dye settle in the way I was hoping for. It is fascinating and really fun. One of my favourite parts of the long process from cone to postage, is skeining the yarn up into hanks once it has dried. That is the moment when you see what the customer will see…and the form of the yarn that as a buyer for many years I would base my decision process on. I love seeing a skein of my own yarn….it’s very addictive and I will hopefully be doing a great deal more of it in the coming years! 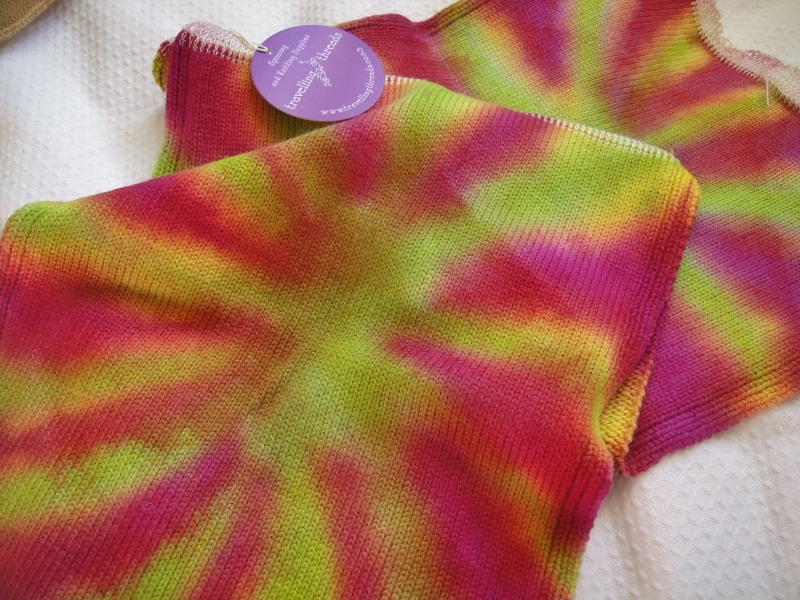 Thank you Hannah, for sharing a bit about yourself and your dyeing with us. As part of this interview, Hannah very generously offered to donate a skein of a custom colourway to readers. We agreed on a little bird that we share in Australia and New Zealand – the Silvereye. To enter the draw to win this skein, I’m going to take a leaf out of My Sister’s Knitter’s blog (if you haven’t already, have a look at Andi’s post about Circus Tonic Handmade – she has a giveaway happening there too!) Visit Circus Tonic Handmade’s etsy store, and comment here about which colourway you like the best. Or tell me which flower from your garden you would like turned into a yarn colourway! Don’t forget to include your email in the appropriate place in the comment form or note your Rav ID in the comment so I can contact you if you win. Entries close on Tuesday, 22 March 2016. 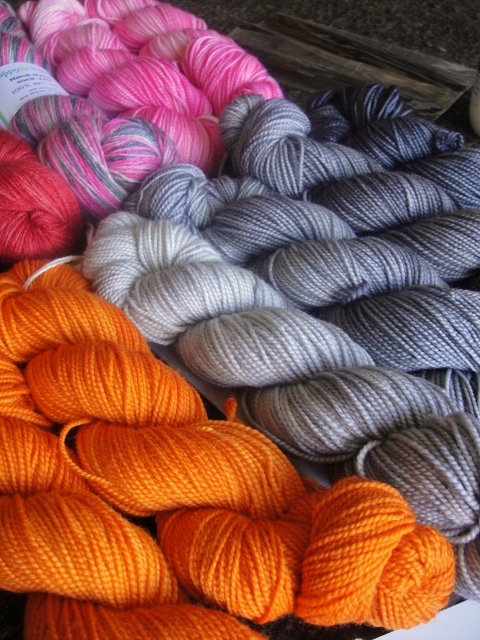 Personally, I’m hyperventilating at the thought of all those beautiful yarns headed our way! Hopefully I will get a chance to visit the store!! Categories: Interview series: NZ yarnies | Tags: Circus Tonic Handmade, giveaway, hand-dyed yarn, Interview, Knitting, Wool, yarn | Permalink. When I had some time off last week, I managed to have one of those rare days of fibre-filled happiness in the company of good people. I do not often get out to ‘play’, and I appreciate the time when I can very much. I spent the day with lovely Alice and Denise of Bleating Art! Alice was down in Wellington visiting Denise, and invited me to spend the day with her. She was dyeing that day, and I have to say I am very lucky to have got a glimpse into the world an indie dyer. So inspiring!! These were delivered to me this weekend. The brown skein is the one I asked her to dye for me. Alice’s yarn colours are so pretty that of course I had to indulge in some of her own inspiration too! The above colours from left to right are Aluminium, Augustus and the Chocolate River (custom colour), Apricot Fizz, Astrid and Aunty Alice. These skeins are 100% merino super-twist yarn base (whether this yarn becomes a regular item in the yarn offering depends on whether more can be sourced). Just looking at those pretty colours makes me smile. 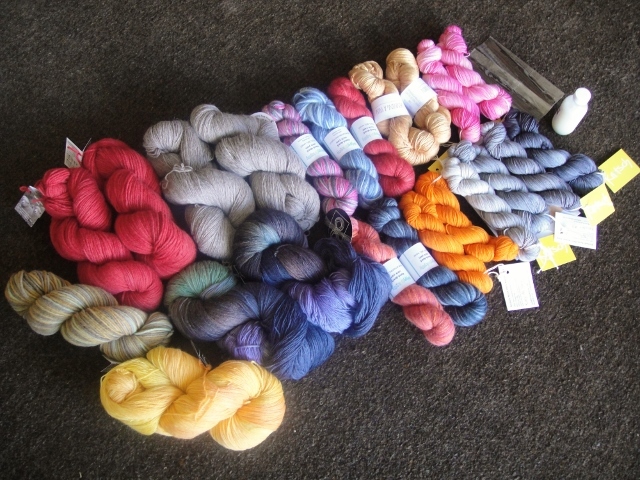 (And if you are wondering, I believe there is still a lot of yarn left in the shop). 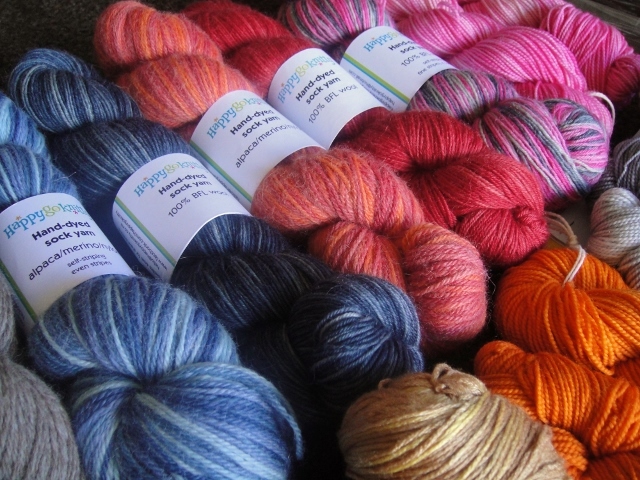 More fibre-filled happiness in the form of being able to go to the knitting afternoon at the Karori Flower Shop (headquarters of Bleating Art Yarn) on Saturday. It was nice to meet new people – including readers of this blog! Hello again! A very big thank you to Alice for so thoughtfully including me in her world of colour. What more can a girl ask for? A cool weekend with a good friend, and the cherry on the top – filled with yarn and knitting talk! 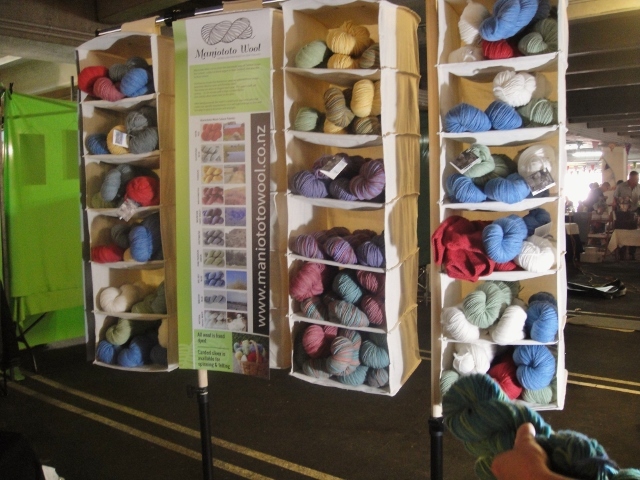 Categories: Sock yarn | Tags: Bleating Art, hand-dyed yarn, Knitting, New Zealand yarn, yarn | Permalink. It was a most wonderful day yesterday. The market was packed, the purchases fast and furious, and many, many crinkly paper bags full of wool went walking out the door, carried by very happy owners. My own purchases amounted to three bags full. I am still grinning with pleasure. 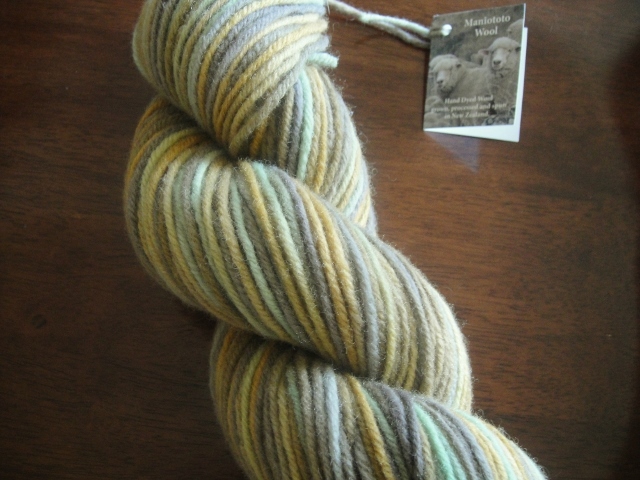 First up, Anna Gratton‘s Little Wool Co. yarns. These are two yummy 200g skeins of 100% pure NZ wool (Corriedale) yarn in the 4 ply weight, in a colourway called “Midnight Sky”. I wanted it as soon as I saw it because it’s going to be my second attempt at the Southern Skies shawl. I have realised that super twist yarn is perhaps not the best for this shawl when combined with my tension (my first attempt came out pitifully small), so I’m going to use this ‘normal spin’ instead, combined with bigger needles. Plus, I think the variegation of dark blue/purple, brown and green is going to make fantastic visual interest in this pi shawl, with the swirling colours going round and round. 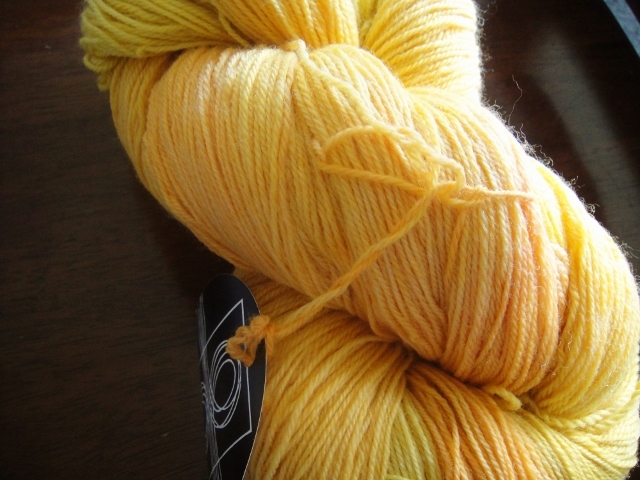 This is also Anna Gratton’s Little Wool Co. 100% pure wool, this time in Saffron. It’s actually an even richer yellow than this photo suggests – more like an egg yolk colour. I love it, and it is going to become the Rosebud shawl. I love yellow roses, and I think this colour will be perfect for it. 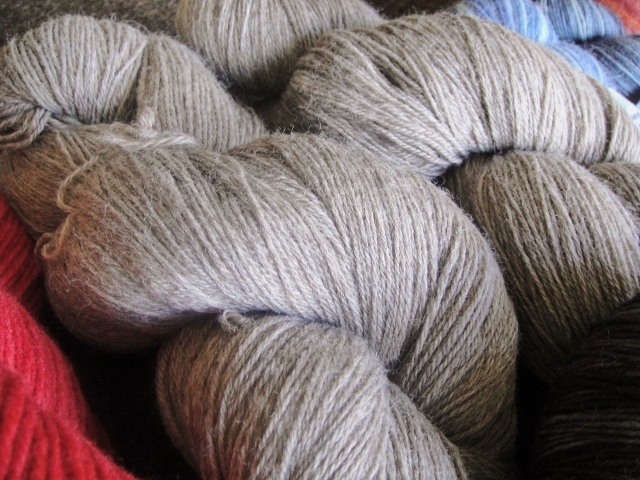 More 4 ply 100% pure wool from Anna Gratton, this is a natural colour wool, the Silver colourway. There are no definite plans for it, but I think a shawl in natural colour would be perfect at some point. You won’t believe how long I had to wait to get this photo! Mary’s stall was crowded with enthusiastic shoppers – I have still managed to get someone’s hand of holding a skein in this pic… despite trying to respect people’s privacy by not taking pictures of them shopping. It was quite funny to see a dozen arms reaching into those hanging display units the first time I went past. It would have made an amazing picture. I am just so happy that her yarn is being recognised. It is really great stuff. This picture was taken at around 11am, and already the stocks were looking low. So what did I get from her? Mary has both aran weight and DK weight yarn. This lot is DK weight, and after seeing the darling little sweater she had knitted in this barn red colourway, I have decided to do the same for my baby nephew. I reckon he’ll look so cute in it! These are two 100g hanks (about 400m in total), so I think there will be enough yarn, as long as I knit it this winter! I think I need to emphasise here how light this yarn is – compared to many wool yarns, this wool is like meringue, it’s incredibly lofty, and very suitable for little ones due to its light weight and lack of scratch. Talking some more to Mary, I realise just how much effort has gone into getting this yarn right. She told me that the first spin she did of this wool was rejected because it did not reflect the quality of the wool – it was too dense and ropey. So she turned to a boutique New Zealand mill, Wild Earth Yarns, with the request that she “wanted the wool to be spun so that the crimp of the fleece is matched by the twist of the spinning.” The deep experience of the mill owner really shows through in the resulting yarn. This one is called Random Tussock. Lush! 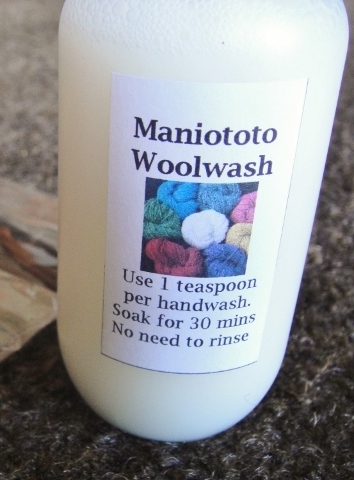 Mary also makes a beautiful wool wash. It has a refreshing eucalyptus scent (made with real essential oils, not synthetic chemical smell), and I was very happy to obtain another bottle from her. Then I spied Spinning A Yarn! Some of you will already know that Jessicah has passed the Spinning a Yarn business to her equally talented sister. Her sister (I rather rudely forgot to ask her name) has started a website for Spinning a Yarn and I have to say, it is very cool. LOVE the way she has displayed those yarns oh so temptingly! (The original etsy site contains the remainder of Jessicah’s work). The idea is to have a new collection of colourways every season, so what you see above is this season’s offering – which will change again in a few months’ time. I couldn’t quite capture the colour correctly in this photo. It truly is a gold. The website pic is more accurate. 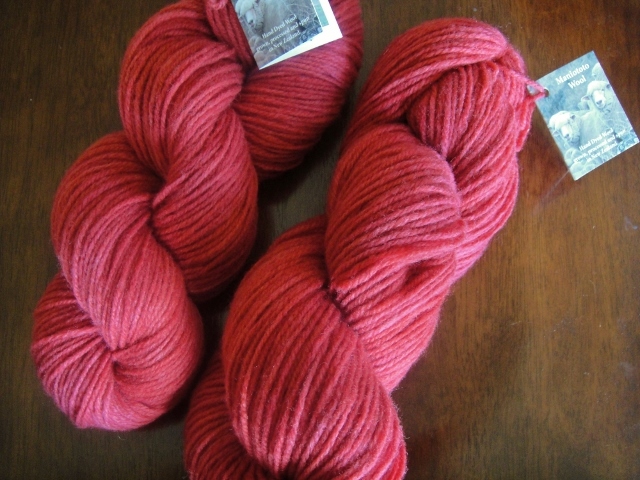 These are two 100g skeins in the 4 ply weight (800m total), destined to become a beautiful shawl at some point. Spinning a Yarn, like all the stalls at the market, was heaving with customers and I had to try to take photos in between hands… here’s one of my out-takes. It made me smile to see so much enthusiasm. Four 50g skeins of yarn were packaged in a cellophane bag, with pattern, and put into a small-sized blank pizza box. Love it! There was plenty of this kit when I wandered over, and if you would like to have one, it is now available on the website. By this time, this shopper’s energy levels were flagging just a bit. All that colour and sensory stimulation had my poor little brain spazzing. I was also conscious that one young boy was getting bored (although he was extremely good and did not complain the whole time I was there, which I was very grateful to him for). From left, a self-striping in blues alpaca/merino sock yarn, destined for the older boy. Deep blue BFL random dyed, another merino/alpaca sock in soft raspberry/tangerine colours, a very lovely red semi-solid BFL and last but not least, the colourway I especially wanted to acquire – a self-striping grey and pink BFL. Super excited I managed to get the last skein!!! The deep blue and raspberry/tangerine yarns were not technically purchased – they are destined to become samples for one of Helene’s upcoming yarn clubs. I feel very honoured that she has approached me to use my Orange Roughy fingerless gloves pattern for the next club. The samples are being knitted to decide which yarn would be better for the club. This is a very thoughtful approach I feel, from the viewpoint of a designer. Helene wants me to be comfortable that the yarn she uses for the club does show the pattern to its best potential – hence my involvement. So that was about it for me. I did also purchase some awesome DPN rosewood needles from 2 Minute Needles. I had a small discussion with them about where the wood came from. The sisters who run 2 Minute Needles have gone to tremendous efforts to ascertain that the source of the wood for their needles is sustainable, and this made me feel comfortable about the purchase. I was also very pleased that I did not exceed my budget for this market. Having worked very hard for the past month, my bank account is healthy enough to sustain this purchase. 🙂 And I was very pleased to invest some of it into New Zealand’s knitting and wool industry. There were other stalls at the market that I did not get time to visit, and also, I had run out of budget funds by this stage… a hand-spinning stall with some beautiful hanks of natural coloured yarn (some of it looked like black alpaca, and was very tempting), Robyn Egge Yarns (I think they must have come down from Auckland), Yarnz (ooh, that Noro looked so pretty…! ), and several others. The next market is in August. 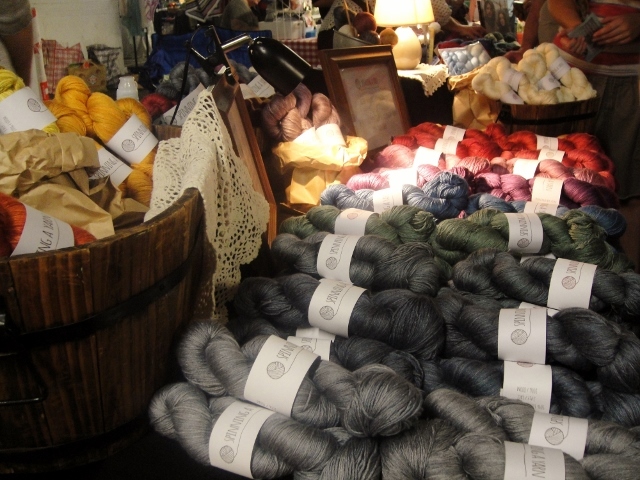 Time to start saving for that, and in the meantime, knit some of this lovely yarn! 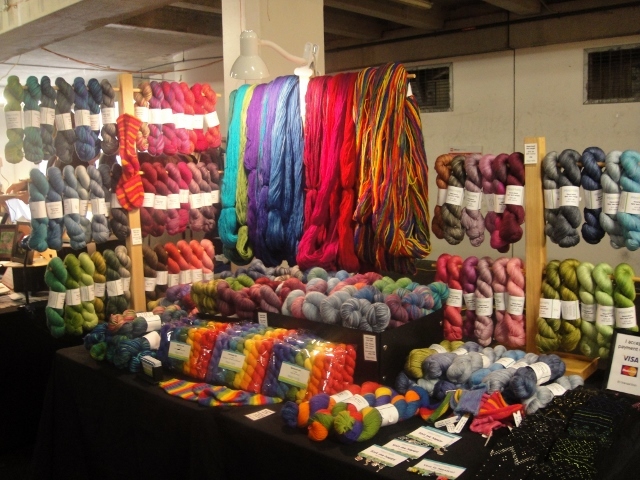 Categories: Knitting events, Wool | Tags: Anna Gratton, hand-dyed yarn, Holland Road Yarn Company, Knitsch, Knitting, Maniototo Wool, New Zealand wool, New Zealand yarn, Spinning a Yarn, Wellington Underground Market, Wonders of Wool | Permalink. It has been a while since I talked about new NZ indie yarnie discoveries. Time for a catch-up, as I have some beauties to tell you about over the next few posts! I did not think that there could be so much variety of sock yarn bases out there, but after these recent discoveries, I have come away very excited by all these new possibilities! Today, I’d like to tell you about a new yarn from Travelling Threads. 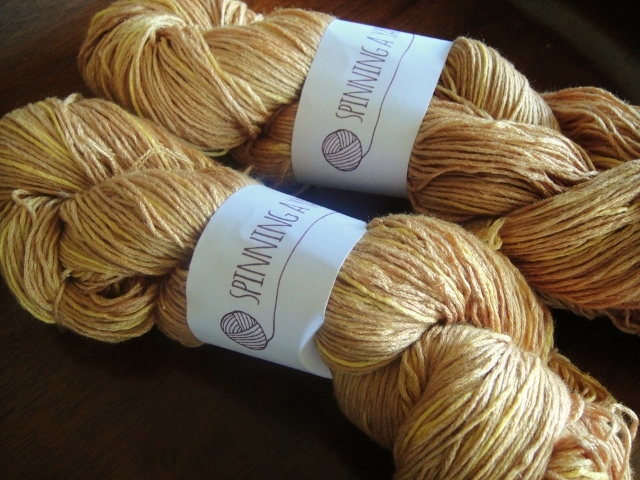 You may remember that I mentioned seeing some of Catherine’s yarn a while ago at a Creative Fibre festival, and I’ve been watching her website with interest to see when she’d start offering her yarns for sale online. Re-knits is from a base that Catherine has had spun in New Zealand from 55% superwash Merino, 25% Mulberry Silk and 20% Nylon, and is approx. 340 metres (371 yard) per 100 grams. This yarn is a heavy sock weight, and my opinion is that it will probably knit socks best on 2.5mm – 2.75mm needles. The blanks are knitted on a knitting machine, and she then hand-paints her original designs on to them. I happened to contact her at the same time she was about to dye some more, and she made the offer of doing a custom job for me. Of course, I had to say yes. I asked her to do something in the colours of the earth in browns and greens, and this is her interpretation. Love it!!! I can’t wait to see how this turns out knitted! The yarn comes with a small instruction sheet which explains how it can be used. 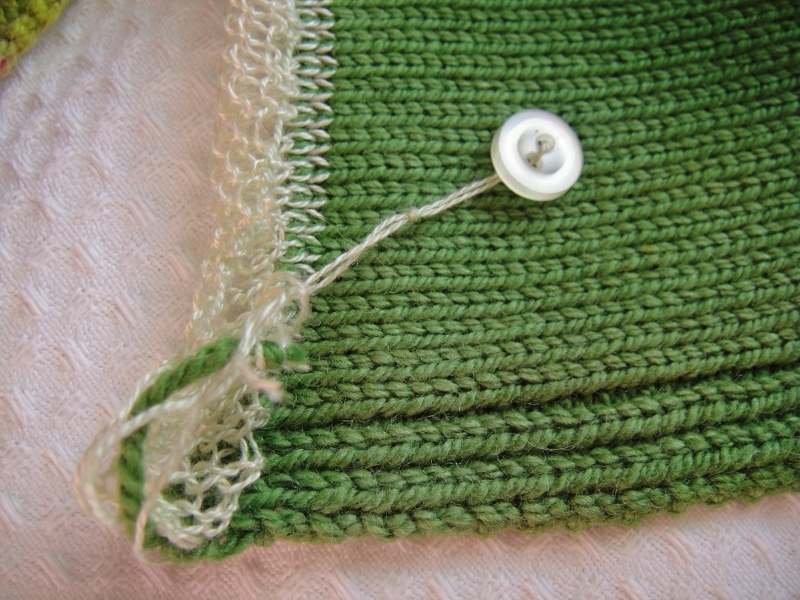 If you have a look at the top picture, you’ll see that the two “pieces” of yarn are separated by a blank layer, so you’ll always know how much yarn is left, and don’t have to worry about running out of yarn for the second sock. then you unravel the beginning yarn, and pull, and knit! This concept really appeals to my macabre love of ripping back. There is something just so satisfying at being able to pull with abandon and watch all those little stitches coming out. As this yarn is hand-painted in two separate pieces, you won’t get two socks that are identical. 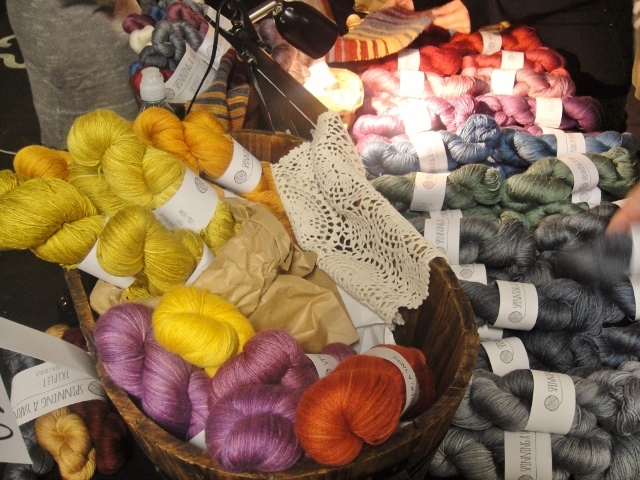 But I think those of us who love hand-dyed yarn are already quite okay with that concept. Of course, you don’t have to knit socks either. This yarn would be very suitable for any small project, like a hat or mittens or even a baby thing. Categories: Sock yarn, yarn | Tags: hand-dyed yarn, Knitting, New Zealand yarn, sock yarn, Travelling Threads, Wool, yarn | Permalink.